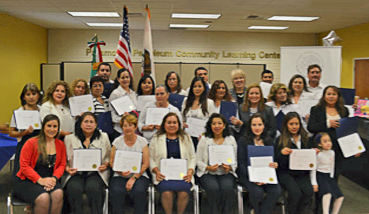 Plaza Comunitaria is a program that offers a great opportunity for adults who have immigrated from Spanish-Speaking countries to finish or begin their elementary and secondary education in Spanish. Plaza Comunitaria is sponsored by INEA (Instituto Nacional de Educaciόn para Adultos. Basic education (literacy, primary and secondary) for youth and adults in educational remediation, both in classrooms and online with goal of facilitating participants in beginning and finishing their studies and receiving a diploma from the Mexican Education System. Access to new information and communication technologies for the development of reading, writing, communication, logical reasoning, and the information needed for participants to find employment. User support in activities related to computer use, Internet, interactive CDs and email. Support for communities by providing meeting space for educational, recreational and cultural events, according to local interests and needs. Provision of permanent venues where applicants can take printed and online exams and obtain certification of primary and secondary studies.